Two University of Colorado Cancer Center studies presented at ENDO 2018 use new models to identify genetic targets and test promising treatments in adrenal cancer. One patient was treated with the immunotherapy pembrolizumab and now more than a year after starting treatment remains on the drug with 77 percent tumor reduction and no new metastases. The story starts in 2013 when, despite the fact that adrenal cancer is rare, four patients with adrenocortical carcinoma presented to University of Colorado Hospital. Faced with dismal prognosis and no available targeted treatments, doctors led by Maggie Wierman, MD, and Stephen Leong, MD, established an adrenal tumor multidisciplinary team including endocrinologists, oncologists, endocrine surgeons, pathologists and radiation oncologists. The team's goal was twofold: to offer the best possible treatment while identifying new therapeutic options for these patients. "One of the biggest barriers in the field of adrenocortical carcinoma research has been lack of a preclinical model. 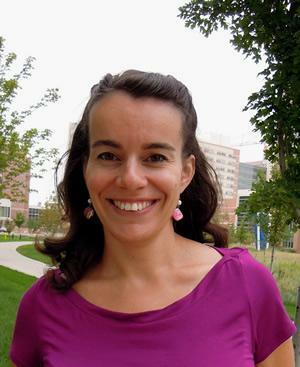 Groups around the country have tried to create cell and animal models of ACC but haven't been successful," says Katja Kiseljak-Vassiliades, DO, CU Cancer Center investigator and assistant professor in the CU School of Medicine Division of Endocrinology. "Now that we have these new models, we can explore the potential benefits and risks of novel treatments," Kiseljak-Vassiliades says. To discover new promising treatments, the group mined publicly available data from the Cancer Genome Atlas (TCGA) and found a 12-fold increase in the expression of the "kinase" PBK in adrenal cancers compared with healthy adrenal tissue. Kinases are enzymes that control the actions of genes, and kinase dysregulation has been implicated in many cancer types. Kinases are also druggable targets, as seen by the success of kinase-inhibitors in earning FDA approval (including, for example, crizotinib against ALK-fusion and erlotinib against EGFR). Increased PBK in patient samples was associated with shorter survival. Using genetic techniques to knock out PBK slowed the growth of the group's adrenal cancer cell lines. A number of pharmaceutical companies offer libraries of inhibitors against hundreds or thousands of kinases. And within one of these kinase inhibitor libraries, the Colorado group found the PBK inhibitor HITOPK32. The drug resulted in greater than 80 percent decrease in growth of adrenal cancer cell lines as well as inhibition of tumor growth in animal models. Postdoctoral fellow Adwitiya Kar, PhD, will describe these finding in an oral presentation at ENDO18 on March 19 at 12:30pm (session OR19-6). "Our goal now is to explore how PBK is upregulated or overexpressed in cancers – is it a mutation, an amplification, a fusion?" Kiseljak-Vassiliades says. "And at the same time, we hope that we are able to continue our work with HITOPK032 to see if it could eventually benefit patients." The team also succeeded in using patient tissue to create a "humanized" mouse model of adrenocortical cancer. These humanized models have been transplanted with a human immune system along with a patient's tumor tissue, allowing researchers to test anti-cancer immunotherapies. In this case, the group used this humanized mouse model to test the FDA-approved immunotherapy pembrolizumab against the condition. Pembrolizumab blocks the action of the tumor-surface protein PD-1, which many cancers use to hide themselves from immune system T cells.